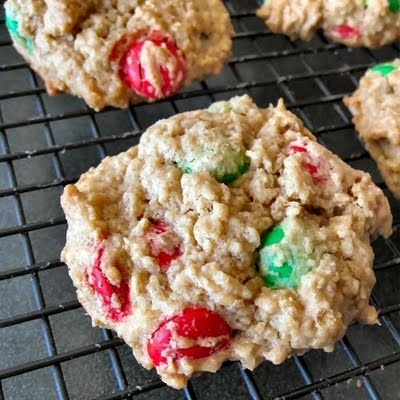 Santa will stay jolly all night when he sees a few of these cookies on his plate. The combination of Coach’s Oats and candy “Fa la la la la 😚🎶”. Preheat oven to 350°. Spray baking sheets lightly with cooking spray. Cream peanut butter, butter, sugar, vanilla, salt and baking soda in mixing bowl. Beat in eggs, scraping down the bowl occasionally. Then add the oat flour and oats and continue missing to combine. Fold in M&Ms. Drop the dough by tablespoonfuls onto prepared baking sheets. Bake for 11-13 minutes, until they’re barely set and just beginning to brown around the edges. Remove from oven and let cool on cooling rack.